Colorado ranks sixth in the nation for gender pay equity — but still has a pay gap — according to an analysis by the American Association of University Women. The analysis showed that on average women working full-time and year-round in Colorado make 84 cents on the dollar compared to men. The state ranks behind New York, California, Florida, the District of Columbia and Vermont. Colorado does rank above the United States’ average as a whole, which is 80 cents to the dollar. However, the analysis highlights that the country’s pay gap has closed by only 7 cents over the past 20 years and is greater for Latinas, who make 54 cents to the dollar, and black women, who make 63 cents to the dollar. The report is meant to recognize Equal Pay Day, which is April 10 and a symbolic day to recognize how women have to work three months longer to make the same as men. This year, the AAUW is calling for states to adopt comprehensive equal pay laws. While 48 states and the District of Columbia have some form of equal pay law — Alabama and Mississippi don’t have one — they vary in scope. 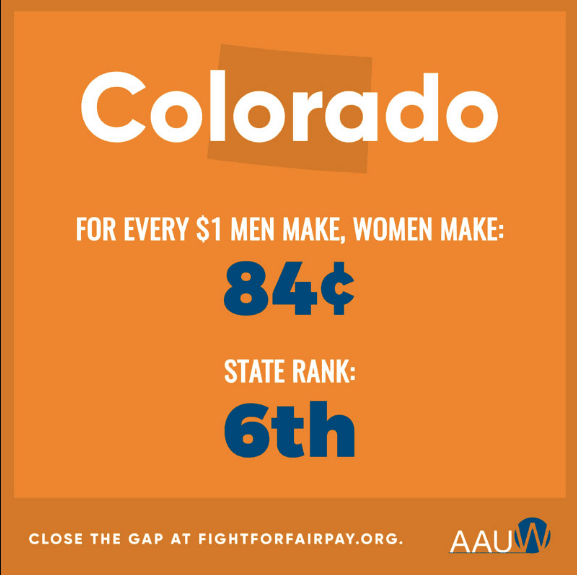 Colorado has moderate pay protections in place, says the AAUW, including prohibiting employers from discriminating or retaliating against an individual for taking legal action to secure equal pay and prohibiting employers from discriminating against an individual for discussing wages. Colorado is not among the four states who prohibit employers from relying on salary history during the hiring process, which is now considered a best practice to achieve equal pay. Colorado was among five states and Puerto Rico that passed equal pay legislation in 2017. However, no new legislation was introduced in the Colorado General Assembly this session. The AAUW is calling for state action, as well as for the federal government to reinstate the Equal Employment Opportunity Commission’s ability to collect data on wages, which was halted last year. It’s also calling on Congress to pass the Paycheck Fairness Act, close loopholes in the Equal Pay Act of 1963 and pass other federal legislation that could help close the wage gap. Finally, the group calls on employers to implement fair pay best practices, such as conducting regular compensation analyses, publicizing pay ranges for positions and prohibiting the practice of asking job candidates for salary histories.